What Makes a Good Heat Gun? This general purpose heat gun by Wagner is great for many different tasks. It works by applying focused heat to the materials that the user wants to remove or work on and provides 1200 watts and 4100 BTUS. There are two temperatures that the Wagner HT1000 has: 750 degrees F and 1000 degrees F. There are also two fan settings that can be adjusted to specific heating needs. The easy to use temperature switch is built right into the handle for maximum convenience. The corrosion resistant nozzle and hanging hook that is integrated into the tool provide lots of convenience to the user. 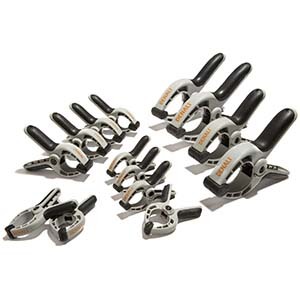 This lightweight tool is rugged and durable and very easy to use. With the 750 degree setting users can thaw pipes slowly, defrost freezers and other slower applications. The 1000 degree setting is good for stripping paint from furniture, loosen rusted bolts and nuts and can make shaping plastic piping for plumbing easy. There are many jobs that you can do with this versatile heat gun. Construction is made from heavy duty plastic which makes it very durable and it will last for years. The low noise design makes for quiet operation and the convenient hanging hook makes easy storage during cool down. The easy to hold design reduces user fatigue as does the weight, which is a lightweight 1.9 lbs. If you don’t have one of these tools in your tool box, you will definitely want to get one. They can do so much when it comes to defrosting things and stripping old furniture and similar jobs. They make fast work of these tasks and speed up the time in which you get them done. The Wagner HT1000 comes with a two year warranty. There are many different sizes, shapes and types of heat guns. There are some that have simple designs and others may be much more advanced with extra capabilities and features. When you need direct, intense heat, a heat gun is the way to go. The majority of homes and businesses can use this tool in some way which makes them a good investment and a valuable tool to have on hand. 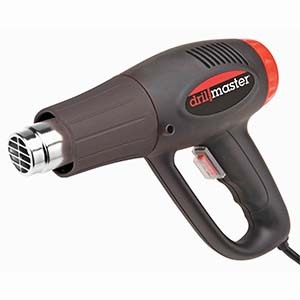 These heat guns, or hot air guns as they are sometimes called, are very versatile power tools that put out a steady stream of extremely hot air. 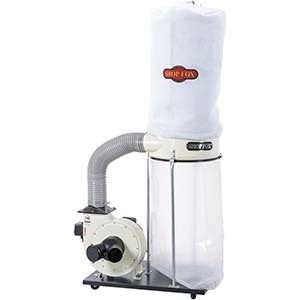 This hot air stream is used to melt, shrink, loosen, and thermally process many different types of materials. This Wagner HT1000 heat gun has 1200 watts of power that makes it perfect for removing old paint, removing old flooring, bending plastics, loosening rusted bolts, thawing frozen pipes; shrink wrapping items and even something as simple as drying wet tennis shoes. You can also defrost freezers, restore furniture, strip kitchen cabinets, heat up plastic to insulate windows and much more. They are the perfect tool for homeowners, DIY-ers, handymen, contractors and artists that may work with thermal plastics. They are really the perfect tool for anyone who may have cause to perform one of the tasks listed above. There are many features that a good heat gun has that are beneficial for the user. Features will be different for different models. We’ve outlined the most common features below for you to look over and compare. Dual temperature- This is where the heat gun offers the user two temperature settings. Guns with dual temperatures are able to handle a larger variety of jobs. Variable temperature – The gun has several different temperature settings or may have small increases in temperature. This adds a level of flexibility for the user in determining the tasks that can be done. Digital Readout – Provides continual, accurate digital measurements of the heat that is being sent out and the programming variables. Ergonomic Design – The design of the heat gun is user friendly and comfortable to hold and handle improving performance and comfort for the user. Ceramic Heating Element – A premium heating element that increases the longevity of the gun and provides premium quality as well. SmartChip – This internal processor provides the ability to have advanced programming features, continuous heat evaluation and control as well. Surface Stand – provides a place to set the heat gun when hot and can also provide hands-free functions sometimes as well. Hanging hook – this is a convenient method in which to hang the heat gun conveniently. It allows for it to cool down and makes for easy storage as well. Thermal Cut Out – This feature will shut the power off in case the gun overheats of falls. We started with a list of heat guns that were available on the market. Once we had that list, we reduced it to the high quality models and then continued to gather information, talk to experts in the industry that have used heat guns on a regular basis in business and looked at blogs, forums, and magazines for more information on what makes a top quality heat gun. We also looked over feedback and customer comments to see what was being said by those who purchased them and used them. From all this information we were able to make our final pick. 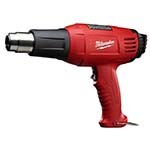 If you want a more professional grade heat gun, the Milwaukee Variable Temperature Heat Gun is the way to go. This contractor quality gun has a user friendly, ergonomic design that is easy to handle, even for long jobs. The light weight is very comfortable, which is important if you are working with your arms over your head. Another benefit to this terrific heat gun is the quiet sound. It can barely be heard when in use. The adjustable temperature is easily accessible with a twist of the rear housing cover. There are many heating options that the Milwaukee offers that will work for various projects around the house. Whether it’s pipe bending or paint removal, this Milwaukee Heat Gun is the one for the job, no matter how tough it is. The heat shields protect the user’s hands and body during use for added safety. The 11.6 amp motor provides the user with a lot of power. The two position switch allows users to choose between from 100 degrees to 1040 degrees. After the initial temperature is set, it can be adjusted incrementally with the dial. 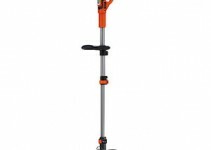 The heating element is impact resistant so it can withstand the harsh demands of the worksite. It is the perfect choice for home and professional use. This great product has a 5 year manufacturer’s warranty. Maintenance is one of the regular tasks that need to be done with any power tools to help them last longer and run at top performance. There are some tasks that need to be done with certain tools and other tools may not need as much. The owner’s manual is the place to look for maintenance information, especially if there is maintenance needed to maintain a warranty. Another consideration that is very important when working with power tools is safety. When you follow safety procedures you will have a lot less chance for accidents and injuries. We’ve listed maintenance and safety tips below. Children and pregnant women should not be in the work area until finished and cleanup is complete. Clean up all removed paint and dust with a wet mop. Use a wet cloth to clean all the walls, sills and other surface where paint dust is. Allow the heat gun nozzle to cool to room temperature before placing in storage. When it comes to finding the right heat gun for your chosen projects and tasks, you have all you need right here. The Wagner HT1000 is a perfect choice for most heat related jobs and tasks. If you need something that is more industrial or professional in use then you can choose our upgrade choice, the Milwaukee Variable Temperature Heat Gun, and take care of even the big jobs effortlessly. We’ve done all the footwork for you in searching out these top choices. Now all you have to do is decide which one of these top picks are for you. Either one is a winner and will provide you with years of service. Part of choosing the right heat gun involves knowing what you want to use it for. Make sure that you know what you need it for so you choose the right heat gun for all of your specific needs.